Monday August 27, 2018 - President Uhuru Kenyatta has given the Directorate of Criminal Investigations (DCI) a go ahead to investigate Leader of Majority in Parliament, Aden Duale, over claims of tax evasion. 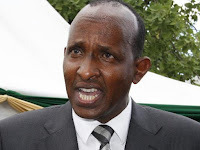 Duale is said to be among a cabal of Somali oligarchs who have been evading tax for years. According to a senior Kenya Revenue Authority officer, Duale, through his many briefcase companies and hotels has evaded tax close to Sh 2 billion. The report by DCI to the President has made Duale go silent and he is no longer in press conferences defending the Jubilee Government. Aware of his eminent arrest, Duale is currently begging the Deputy President William Ruto to intervene and tell the Son of Jomo to have mercy on him. However, President Uhuru Kenyatta has insisted that no matter your status in society, the wheels of justice will catch up with you and you will be arrested like any other criminals if you steal public money. Duale is among Uhuru’s delegation that is currently in Washington DC to meet US President, Donald Trump.